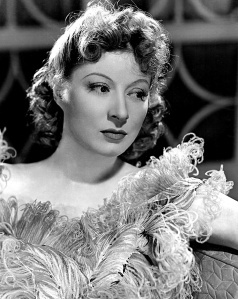 In its monthly preview of TCM's schedule, The Hollywood Revue reports that the lovely Greer Garson is the Star of the Month for March, with her films featured every Monday night. Mrs. Miniver and Random Harvest are among the movies to be aired. Today's Sunrise Serenade was "St. Louis Blues" by Sidney Bechet and the Bluenote Jazzmen. Click on the song title to listen courtesy of Jazz On Line. The playlist for the February 27, 2013 broadcast of the Swing Shift Shuffle has been added to the playlist filing cabinet. I have never had much interest in jewelry, but I do like a nice watch. Some of my favorites are the rectangle or square Art Deco style watches from the 1930's. Dieselpunk posted two nice images of an original 1934 Cartier watch, as well as a modern replica. The Red Hot Lindy Hop lesson and session continues this Friday night at the Rumba Room. Free lesson at 7:00 p.m. Free admission before 7:00, and $5 cover at the door afterwards. The lesson will be by Mike and Angela, with music by Alexis. Dress like you are going out! 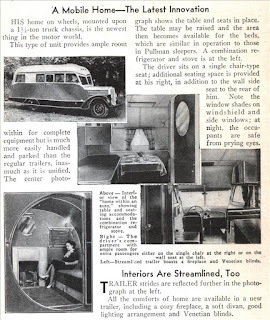 One of the thousands of projects I want to try, but will probably never begin, much less complete, is a retro-style 1940's bus to RV conversion. Modern Mechanix posted this article from the October 1937 issue of Mechanics And Handicraft to show how folks did it with (then) much newer vehicles. This morning's Sunrise Serenade was "I've Got My Love To Keep Me Warm" by Red Norvo and Mildred Bailey. Click on the song title to listen courtesy of Jazz On Line. Warner Bros. took a satirical aim at swashbucklers (including its own star, Errol Flynn) and the movie industry in this 1948 Daffy Duck ﻿cartoon. From the Internet Archive, here is The Scarlet Pumpernickel. This morning's Sunrise Serenade was "I'd Rather Lead A Band" by Bunny Berigan and His Boys. Click on the song title to listen courtesy of Jazz On Line. The Hemmings blog posted this really cool Chevrolet Jam Handy film that provides a simple but thorough explanation of how a differential works. Even after 75 years, this demonstration is just as informative as it was then. Today's Sunrise Serenade was "Star Dust" by Louis Armstrong. Click on the song title to listen courtesy of Jazz On Line. The playlist for the February 20, 2013 broadcast of the Swing Shift Shuffle has been added to the playlist filing cabinet. Now here is an eye-catcher. 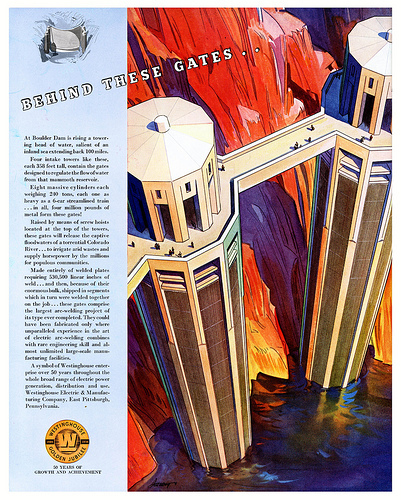 This 1936 Westinghouse ad about Boulder Dam, posted on Deiselpunk, boasts some striking color and design. This morning's Sunrise Serenade was "I'll Be Glad When You're Dead, You Rascal You" by Louis Armstrong. Click on the song title to listen courtesy of Jazz On Line. The Red Hot Lindy Hop lesson and session continues this Friday night at the Rumba Room with live music from Jayna Morgan and the Sazerac Sunrise Jazz Band. Free lesson at 7:00 p.m. Free admission before 7:00, and $7 band cover at the door afterwards. The lesson will be by Kishore and Heather. Dress like you are going out! Today's Sunrise Serenade was "My Honey's Lovin' Arms" by Bing Crosby and the Mills Brothers. Click on the song title to listen courtesy of Jazz On Line. 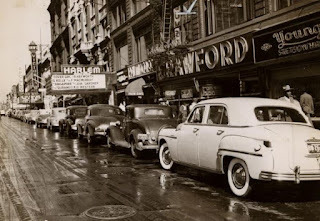 In this carspotting photo from the Hemmings blog, we visit Harlem in 1949. 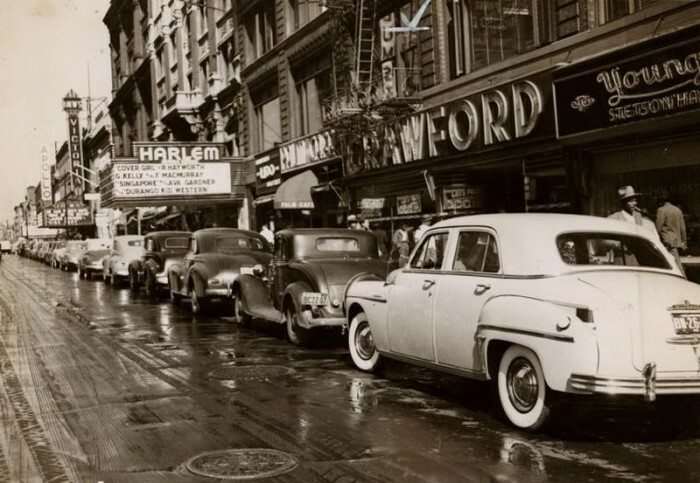 Aside from the cars, it is interesting to note the theaters marquees (including the Apollo) and the movies playing at the time. This morning's Sunrise Serenade was "Georgia On My Mind" by Hoagy Carmichael. Click on the song title to listen courtesy of Jazz On Line. In the days before GPS, all navigation problems could be corrected by turning left at Albuquerque. Once again, however, our hero Bugs Bunny fails to heed this advice, and ends up at the South Pole, where he is forced to help out a hapless penguin. Ignoring the geographical and zoological inaccuracies, this cartoon is classic Chuck Jones fun. From the Internet Archive here is the 1948 animated short, Frigid Hare. This morning's Sunrise Serenade was "Someone Stole Gabriel's Horn" by Bunny Berigan. Click on the song title for a sample from emusic, or click here for the album page. 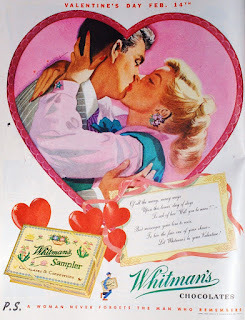 For Valentine's Day, RetroPlanet has a neat post on the history of the Whitman's Chocolates ads associated with February 14. Today's Sunrise Serenade was "Begin The Beguine" by Artie Shaw. Click on the song title to listen courtesy of Jazz On Line. The playlist for the February 13, 2013 broadcast of the Swing Shift Shuffle has been added to the playlist filing cabinet. 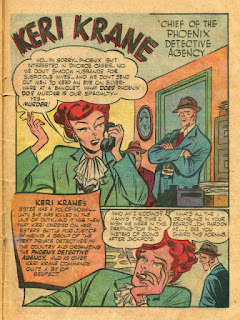 As posted on Four Color Shadows, Keri Krane was the sister of a murdered policewoman, who decided to continue her sister's fight for justice by running a detective agency. 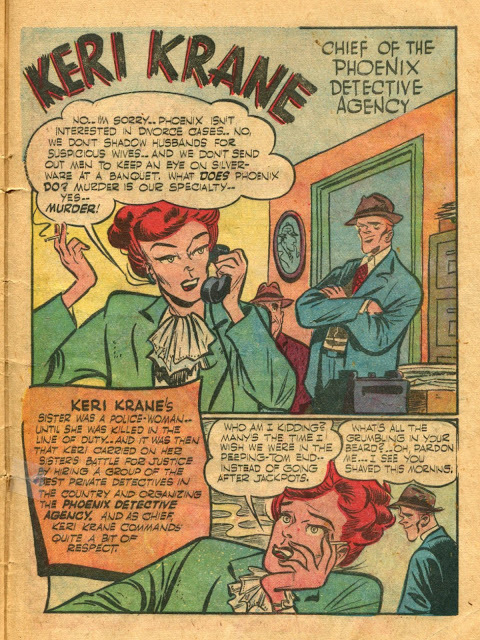 I have to agree with the poster that Keri is most certainly a copy of Katherine Hepburn, both in appearance and in the style of the dialogue. It reminds me of the fast paced exchanges between Hepburn and Cary Grant in Bringing Up Baby. This morning's Sunrise Serenade was "Sweet Sue" by Django Reinhardt and the Hot Club Quintet of France. Click on the song title to listen courtesy of Jazz On Line. The Red Hot Lindy Hop lesson and session continues this Friday night at the Rumba Room. Free lesson at 7:00 p.m. Free admission before 7:00, and $5 cover at the door afterwards. The lesson will be by Kirk and Erin, with music by Jessica C. Dress like you are going out! 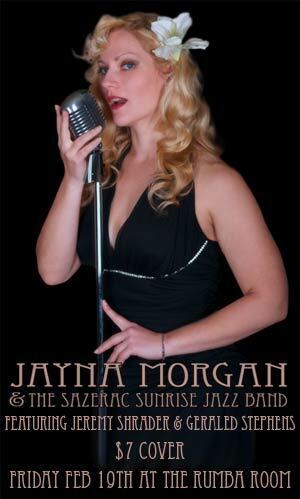 Next week: Jayna Morgan and the Sazerac Sunrise Jazz Band return to Memphis for the RHLH. Today's Sunrise Serenade was "Swing Low, Sweet Chariot" by the Casa Loma Orchestra. Click on the song title for a sample from emusic, or click here for the album page. A friend sent me a link to 30sjazz.com, a site that features videos of (as its name implies) 1930's jazz music. Some of the videos are actual film footage of the musicians performing, while others are essentially audio files of the music with still photographs for visuals. There is a nice mix of artists here, including this piece from Blanche Calloway (yes, Cab's older sister), who was successfully leading a band years before her little brother. This morning's Sunrise Serenade was "Pavanne" by Glenn Miller and His Orchestra. Click on the song title to listen courtesy of Jazz On Line. 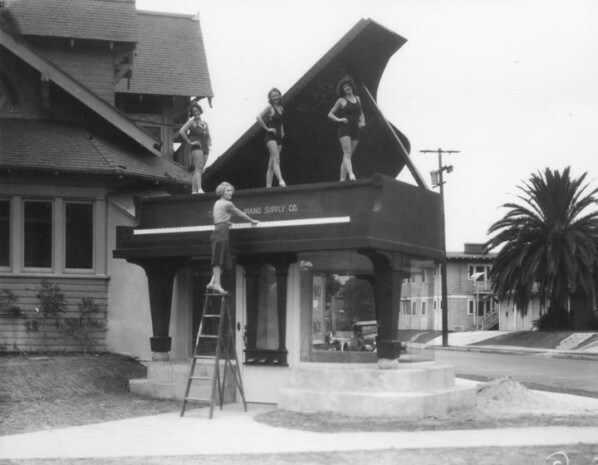 Early Betty Boop cartoons usually have a surreal flavor to them, but in this case, Fleischer Studios made the surreal the main theme. Bosko and Betty take a trolley to Crazy Town, where everything operates just a little "different." From the Internet Archive, here is the 1931 animated short, Crazy Town. This morning's Sunrise Serenade was "Shine On Harvest Moon" by Jimmy Dorsey. Click on the song title for a sample from emusic, or click here for the album page. As I previously noted in a July 2012 post, Marilyn Monroe does not appear much on this blog because her fame really started in the 1950's, rather than the Swing Era. 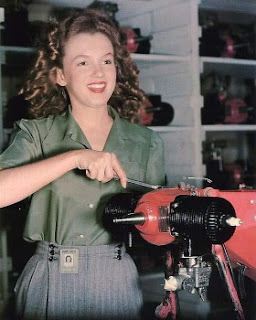 These photos, taken in 1945 and posted on Retronaut, were taken well before Marilyn existed, are what launched that fame. Norma Jean was a war worker, assembling remote control target drones. Today's Sunrise Serenade was "Swanee River" by Les Brown and His Orchestra. Click on the song title for a sample from emusic, or click here for the album page. The playlist for the February 6, 2013 broadcast of the Swing Shift Shuffle has been added to the playlist filing cabinet. 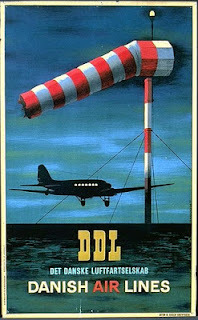 Dieselpunk posted this 1945 poster from Danish Air Lines, and I am reposting it simply because it features a Douglas DC-3, one of my favorite aircraft. The Red Hot Lindy Hop lesson and session continues this Friday night at the Rumba Room. Free lesson at 7:00 p.m. Free admission before 7:00, and $5 cover at the door afterwards. The lesson will be by Mike and Amanda, with music by Amanda. Dress like you are going out! Today's Sunrise Serenade was "Begin The Beguine" by the Andrews Sisters. It happened this moring, as always, but I could not get it posted until now. Better late than never! Enjoy the video from YouTube. Remember the Brown Derby, a restaurant shaped like a man's derby hat? A post of mimetic architecture on Retronaut has a series of photographs of buildings shaped like anything other than a building. This piano supply company is my favorite. This morning's Sunrise Serenade was "Rhumboogie" by the Andrews Sisters. Enjoy the video from YouTube. In this Ub Iwerks version of the classic children's story, Goldilocks looks a little like Bette Davis, and she basically does a breaking-and-entering job on the three bears house. From the Internet Archive, here is the 1935 animated short, The Three Bears. Today's Sunrise Serenade was "Arkansas Traveler" by Stan Kenton and His Orchestra. Click on the song title for a sample from emusic, or click here for the album page.